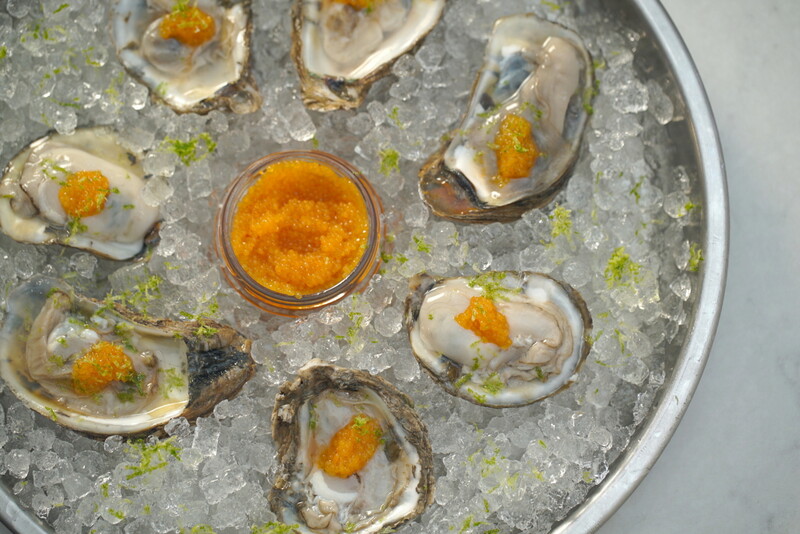 For your next dozen oysters, skip the hot sauce and try a little gin, a dollop of Masago or Tobiko roe, and lime zest. These bright, delicious gin oysters also skip the shot glass, so you can easily serve a crowd. Being careful to preserve oyster liquor, shuck oysters and place them on a bed of shaved ice or salt. Fill each shell with gin. Use a teaspoon or a dropper. Place a tiny dollop of roe on each oyster. TIP: Place the roe directly on the oyster. It will disperse if placed in the liquid. Garnish each oyster with a pinch of lime zest. This recipe calls for Masago or Tobiko, which raises the question, “What’s the difference?” Both are fish eggs or “roe.” Masago (the bright orange roe atop the sushi rolls below), comes from capellin, a member of the smelt family found in the Atlantic and Arctic oceans. Tobiko (the bright red eggs, below) is flying fish roe. Both add a little sweet and salty flavor to an oyster or sushi. 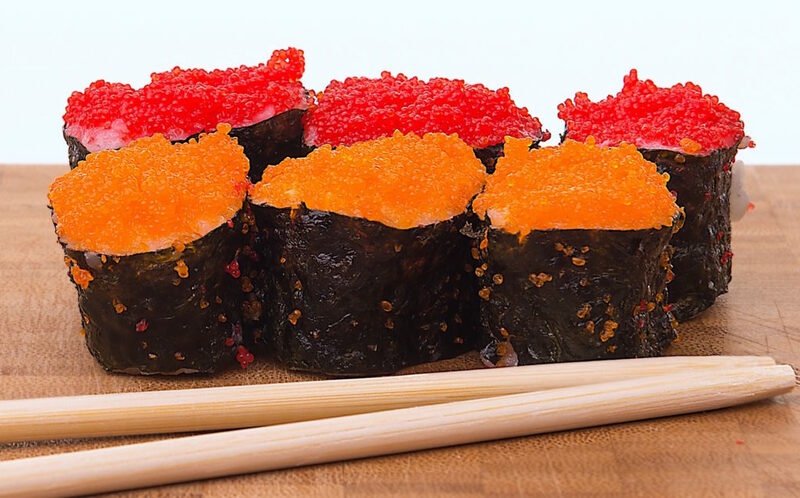 Since Tobiko is slightly larger than Masago it brings a more distinct crunch to foods. Masago is less expensive and usually more readily available in supermarkets. Purist may disagree, but for most recipes the only thing you’re giving up using Masago is the vibrant red color. Bright red tobiko and bright orange masago roe atop sushi rolls. Sign up for the weekly oyster recipe newsletter. Free!